1. 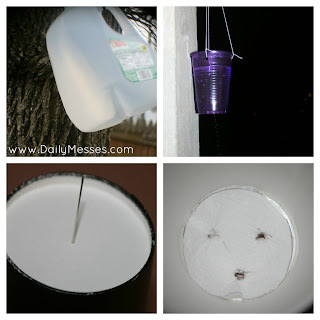 Use a hole punch or large needle/pin to poke 3 holes around the top of the jug/plastic cup. 2. Tie string through holes and allow several inches of length and tie together at the top to form a hanger for the cup. 3. Poke a tiny hole in the bottom of the cup with the needle or pin. 4. Fill with water and hang outside on a nail or branch before you go to bed on a cold night. 5. An icicle should form overnight. I tried the single pin hole at the bottom of a plastic cup over night. No luck. I tried the single hole in a paper cup over night. No luck. Next, I tried a double cup method (top cup has 3 holes punched in to dribble down to the bottom cup, which has 1 pin hole). No luck. I then poked two pin holes in the bottom of a cup and placed a piece of thread through one hole, thinking that the water would freeze on the string. No luck. 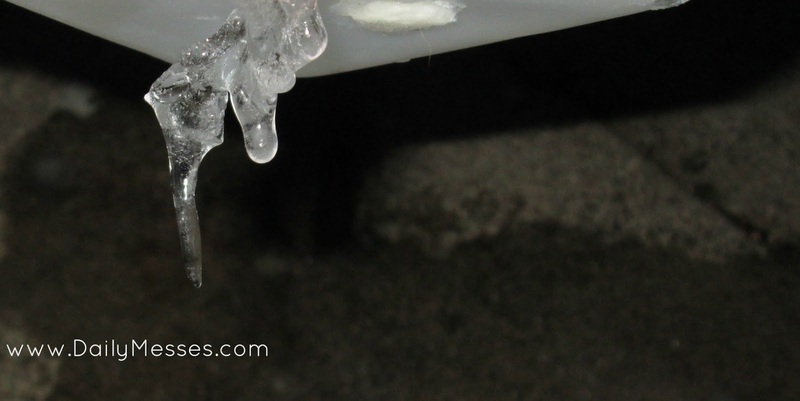 It's been really cold around here, so I thought the icicles should form. Instead the water froze in the cups. Next I tried a gallon milk jug. I thought that with more water, it would have a better chance of creating an icicle. Instead, the entire jug froze too. With the milk jugs, I experimented with the caps on and off. The water flowed a lot more with the lid off, but still no results. I finally, finally got a tiny icicle to form. I used a milk jug and poked a hole with a thicker needle so there was a larger hole for the water flow through so it wouldn't simply freeze in the jug. Some of my attempts at making an icicle. Have you tried to make your own icicles?